SPARTANBURG, S.C. & ARNHEM, Netherlands – Today, leading U.S. flame resistant (FR) textiles brand Westex™ by Milliken™ and global aramid fiber producer Teijin Aramid announce a joint technology and commercial partnership for Southeast Asia and Australasia. Combining more than 100 years of FR innovation, Westex by Milliken and Teijin Aramid look to improve the reputable aramid-based FR solutions in the Asian market. As a brand of Milliken & Company, a global protective and performance textiles, chemical and floor covering manufacturer, Westex by Milliken fabrics underpin FR garments relied upon every day around the world — illustrating a trusted track record of performance and dependability. Westex by Milliken utilizes Milliken’s legacy of more than 150 years of innovation and a strong commitment to research and development to produce branded FR textiles that are leaders in a variety of protection industries. As the world’s number one aramid producer, Teijin brought the first aramid fibers to market in the early 1970s and continues to be a leader in best-in-class FR fiber technologies. Teijin has demonstrated its dedication to performance-driven, aramid-based solutions markets worldwide over the course of the past century. “Teijin Aramid is delighted to team-up with Milliken. We look forward to jointly exploring opportunities to better serve customers, combining our technical brains as well as commercial power. The vast experience and know-how of Teijin Aramid, combined with the expertise of Westex by Milliken makes for a powerful and winning combination,” says Bernd Steinmann, Teijin Aramid’s global business manager protective apparel. As a result of the partnership, Westex by Milliken and Teijin Aramid proudly present Westex™ Synergy™ Pro, a cutting-edge aramid FR fabric. Compliant to NFPA 2112 and NFPA 70E, and certified to EN ISO 11611 and EN ISO 11612 for oil and gas industry flash fire hazards, Westex Synergy Pro offers the highest comfort level in a reputable protective aramid fabric for daily wear FR apparel. Exclusive to the Southeast Asia and Australasian markets, Westex Synergy Pro is available for purchase beginning November 27, 2018. Powered by Teijinconex® meta-aramid staple fibers, Westex Synergy Pro builds on Westex by Milliken’s award-winning FR expertise to create a performance-driven aramid fabric with guaranteed FR protection. Westex Synergy Pro features superior softness and six times better moisture-wicking capabilities compared to other leading aramid FR fabrics. 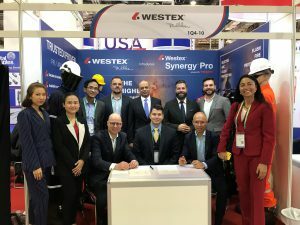 Available in a variety of colors and in both 160 g/m2 and 200 g/m2 weights, Westex Synergy Pro makes FR daily wear uniforms a simple and attractive safety solution for the Asia Pacific oil and gas industry. “This Westex by Milliken and Teijin Aramid partnership ushers in a new era of possibilities for FR apparel for Southeast Asia and Australasia, for which we are honored to lead the charge,” Layton adds. “We see this partnership with Milliken in Asia Pacific as an important stepping stone for future growth together,” underlines Erik Delnoij, vice president of sales and marketing for Teijin Aramid.